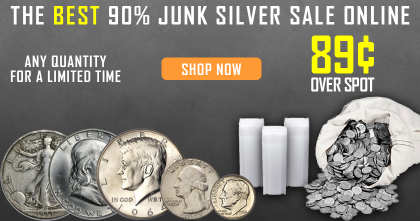 If you are a silver collector or investor, today is your opportunity to acquire 90% "Junk" Silver coins at the lowest premium in nearly a decade! Why buy "Junk" silver? It has the best combination of liquidity, divisibility, and low premium of any silver product on the market today. U.S. Government-Issued: As such, they are universally trusted as to their weight, purity and composition. Pre-1965 silver coins are recognized throughout the marketplace and highly liquid. Low premiums: In today’s market, 90% silver coins can be bought for a minuscule premium over their melt value. However, that is not always the case – more on this below. While 90% silver coins are currently trading for tiny premiums, this situation has not always been the case. In fact, just two years ago, junk silver was wholesaling for a whopping $4-$6 per ounce over melt! Since these coins are no longer made and have a finite supply, their premiums can fluctuate dramatically. During supply squeezes (like the Greek banking crisis of 2015), supply rarely satisfies demand and prices often shoot upward. As of this writing, you can own pre-1965 “junk” 90% silver coins for just 89c per ounce over spot. That’s less than half the premium of a 2017 1 Oz American Silver Eagle or a 5 Oz America the Beautiful coin! Choose from a complete selection of denominations, sizes, and increments. Monument Metals is offering this special price on 90% silver Dimes (Roosevelt), Quarters (Washington), and Half Dollars (Walking Liberty, Franklinand 1964 Kennedy). Whether you prefer to hold 90% silver in the form of $1 of face value, tubes, or bags, your cost is 89c per ounce for any size order. As low as these prices are, they include free shipping for all orders of $99 or more. Don’t want to spend $99? Not a problem – just cover our shipping cost of $4.95. If you’re looking for low-cost silver that’s liquid, divisible, universally recognized and perfect for trade/barter, 90% silver is the best value in today’s market.